Where to find synthetic lubricants in Charlotte? At Lewis Systems, Inc., of course. You’ve probably found that using synthetic lubricants in your air compressors are more than just an ideal way to “go green” in the industry: Synthetic compressor lubricants add uninterrupted up-time to your compressors’ working life and actually out-perform petroleum lubricants. Lewis System’s synthetic lubricants will provide your rotary screw or rotary vane compressors with a median uninterrupted operation of 8,000 hours at as much as 195 degrees F, giving you a varnish-free environment while protecting against rust and corrosion. 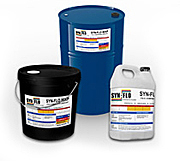 Need H-1 food-grade quality synthetic lubricants that meets FDA requirements? Our synthetic compressor lubricant completely separates from water and has a low tendency to carbon or varnish under normal operating conditions. Heat poses the greatest danger to your air compressors, accelerating the rate at which oil oxidizes and weaken seals and o-rings. Lewis Systems’ synthetic compressor lubricants act as a coolant, carrying heat away and reducing the amout of oil that your compressor consumes. If you’re still using petroleum lubricants in your air compressors, call us to learn more about how our synthetic lubricants can add life and uninterrupted operating time to your compressors. If you’re already using synthetic lubricants, let us show you why ours are best. For synthetic lubricants in Charlotte, call us at either (704) 588-2299 or toll free at (800) 654-0776.